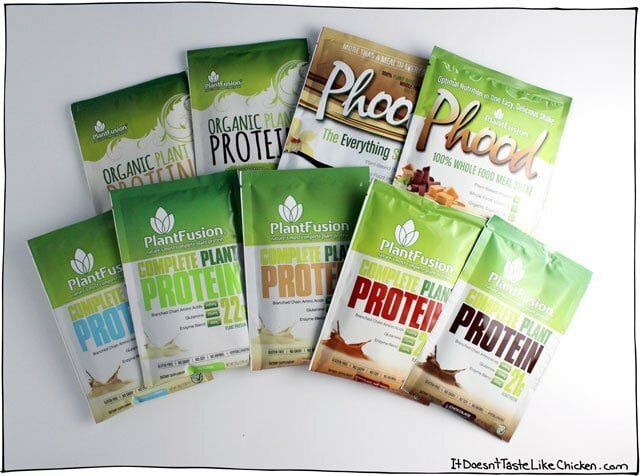 This post is sponsored by PlantFusion, who I love for their vegan gluten-free protein powders. Vanilla chai, chocolate raspberry, chocolate caramel, cookies n’ créme! So many fun flavours. My besty Gretty just got her personal training license. Woot woot! Congrats dear friend. She’s the kind of person who does these things for “fun”, and no other reason. She just wants to be that much more awesome at lifting heavy things. 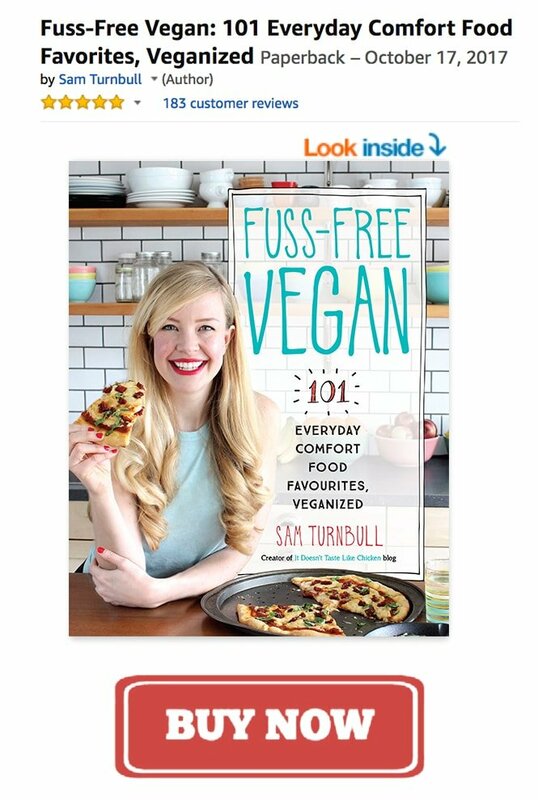 Did I mention she is vegan, and pretty much the coolest? Yeah. This joy of lifting heavy things started a couple of years ago when we took a bodybuilding course together. Yes, you heard me right, this little vegan took a course with muscly, carnivorous, bodybuilders. The actual kind who spray on orange fake tans and pose in tacky bikinis on stage. It’s not my goal to look all muscly like that (not that there is anything wrong with that), but we figured that these people knew what they were doing. I mean, you could literally see that they knew what they were doing. I’m actually surprised at how many personal trainers at the gym don’t look very fit, and I am even more surprised when I see people paying them to be taught how to be fit. To me, that’s like going to an accountant who is broke, or a lawyer who is in jail. I learned A LOT from these bodybuilders. Unfortunately, they weren’t so informed in the nutrition department, and I got a lot of the “you’re going to die of protein deficiency” lectures. At least they were anti-dairy, I’ll give them that. The lack of support for my veganess was surprising to me as there are SO many vegan bodybuilders these days. Torres Washington, Derek Tresize, fellow blogger Sam Shorkey, and of course the crazy YouTuber Vegan Gains, just to name a few. Search for #veganbodybuilding on Instagram and you will find an endless stream of six packs. Like seriously, one of the worlds strongest men is totally legit vegan, Patrik Baboumaian. Yeah muscles! So do I do bodybuilding myself? Absolutely! Weight lifting is my favourite way to work out. I have never felt stronger and more lean than I do now. Going vegan had a lot to do with that, but weight lifting is like the last little finesse, that hides the fact that I probably eat too much chocolate, and drink too much wine occasionally. Shhhh! 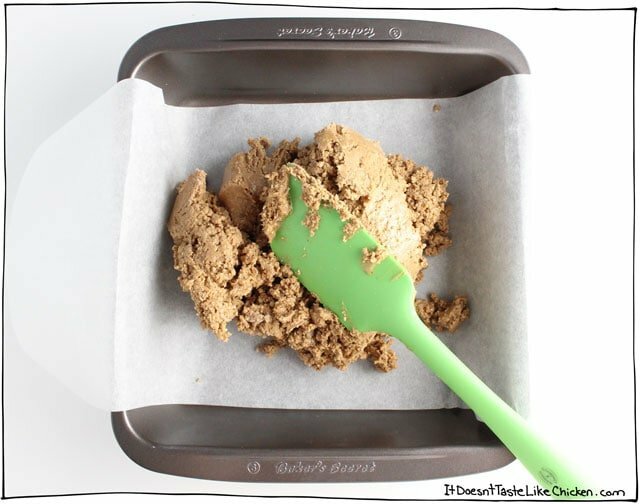 What better way to celebrate plant-based muscle, than with these super easy, no bake protein bars! These bars literally taste like the inside of a peanut butter cup, except they have the added benefit of being GOOD for you. PlantFusion protein powders are made with a blend of quinoa, sprouted amaranth, yellow peas, and artichokes (…artichokes, neat!). No scary chemicals, artificial flavours, or preservatives. This is a great option if you are looking for a healthy vegan protein powder. 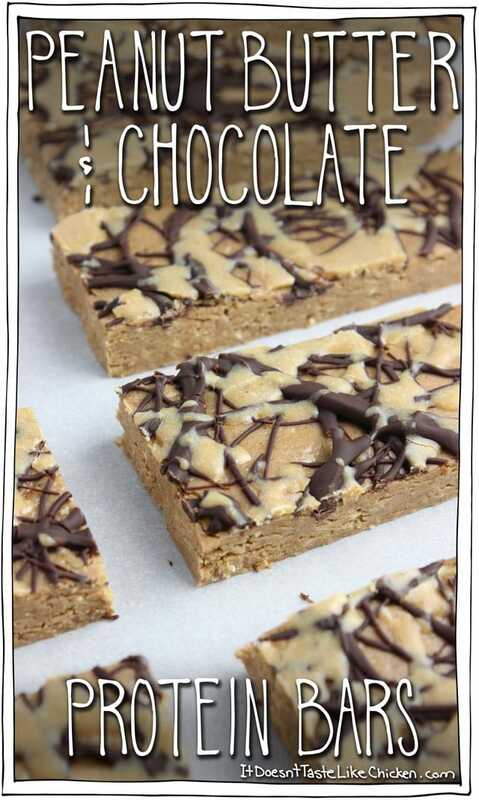 Lets get to making Peanut Butter & Chocolate Protein Bars! 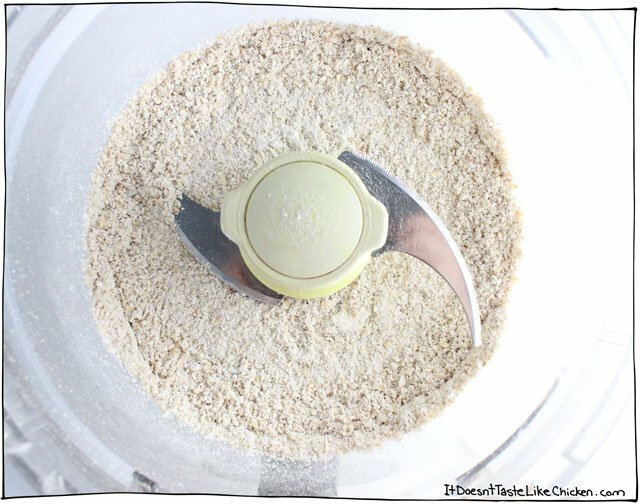 Add the oats to a food processor and blend well until the oats break down into a powder. Alternatively, if you have oat flour, you can just use that instead. Oat flour is just powdered oats! 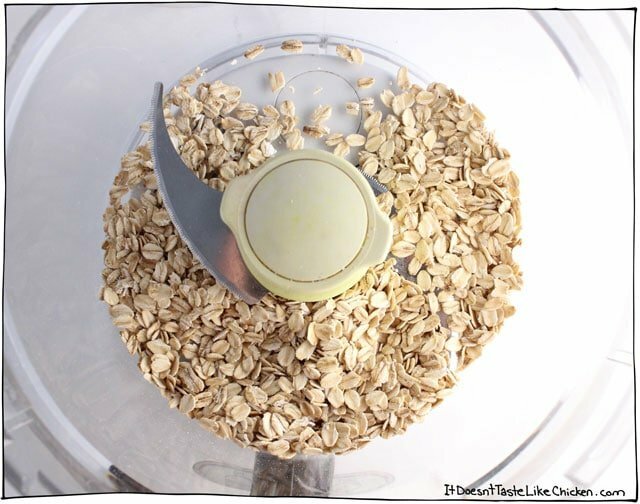 I save my dollars and cupboard space and just make my own by blending the oats myself. 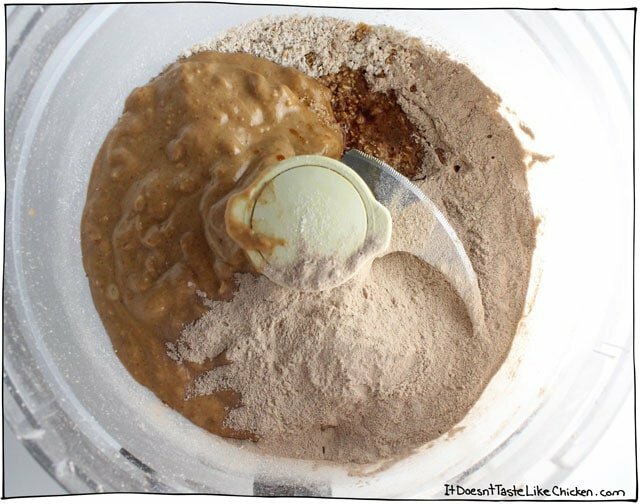 Add the remaining ingredients for the bars, the PlantFusion protein powder, peanut butter, agave, vanilla extract, and salt. Blend well to combine, stopping to scrape the sides as needed. It will be a dry crumbly dough, like so. 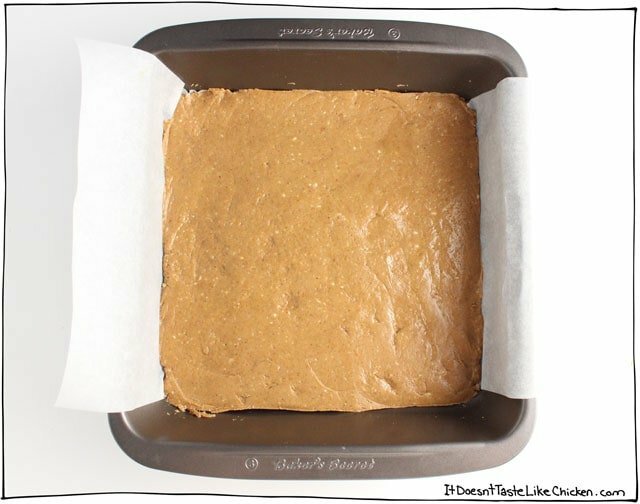 Line an 8″ x 8″ pan with parchment paper, and leave some of the paper hanging over the edges to form handles. Scoop all the dough into the pan, and press firmly to spread the dough and pack it flat as possible into the pan. I find it’s easiest to pack the bars down with my hands, and then smooth out with a spatula or other flat surface. To make the chocolate drizzle, add the chocolate chips to a small pot and place over low heat. Stir continually as they melt, and remove from heat when almost completely melted but there are still a few remaining unmelted pieces. This is to ensure you do not burn the chocolate. Alternatively you could melt them in a microwave, but I don’t have one so you will have to figure that out on your own! Use a spoon or fork to drizzle the chocolate across the bars in any pattern you like. Pop in the fridge or freezer for a few minutes to set the chocolate. 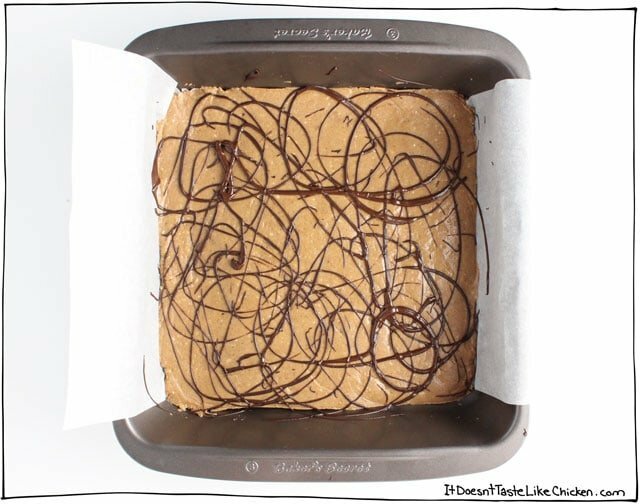 To make the peanut butter drizzle, melt the coconut oil, and whisk in the peanut butter and agave. If the mixture seems very thin, chill it in the fridge or freezer for a few minutes to thicken. If you chill it too long and it turns solid, just melt it again. 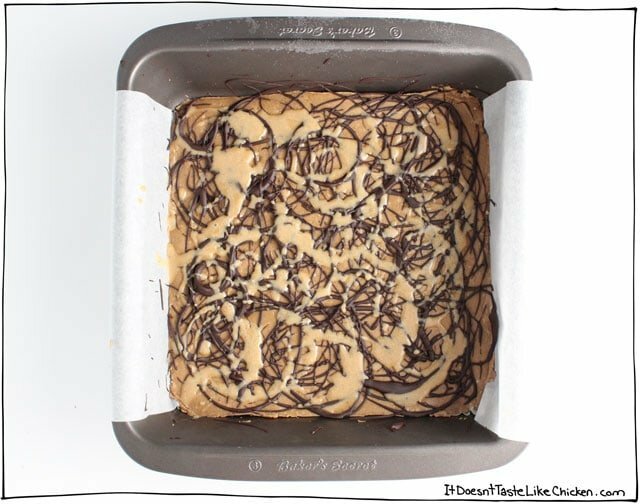 Use a spoon or fork to drizzle the mixture across the bars in any pattern you like. 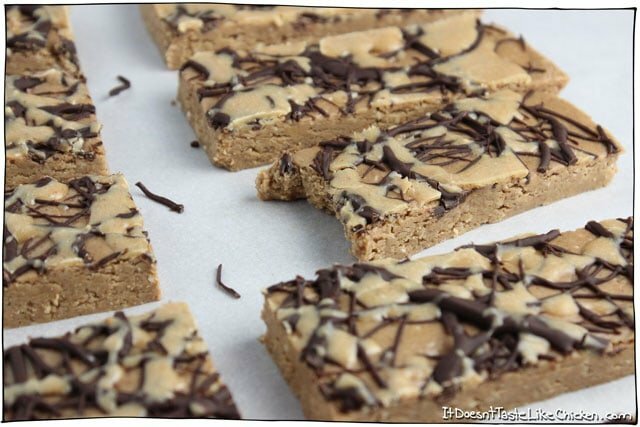 To set the bars, put the pan of protein bars in the freezer for about 30 minutes until completely set. Once set, use the parchment to lift the bars out of the pan. Use a large knife to cut into bars or squares… or triangles for that matter. Any shape you like! Store in an air tight container in the freezer. These are best eaten straight from the freezer as they will soften at room temperature. I am always snacking on little pieces of these! So yummy. These taste exactly like the inside of a peanut butter cup. 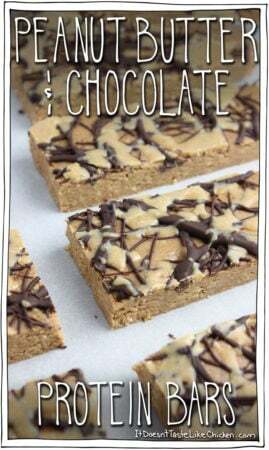 No bake and so easy to make! 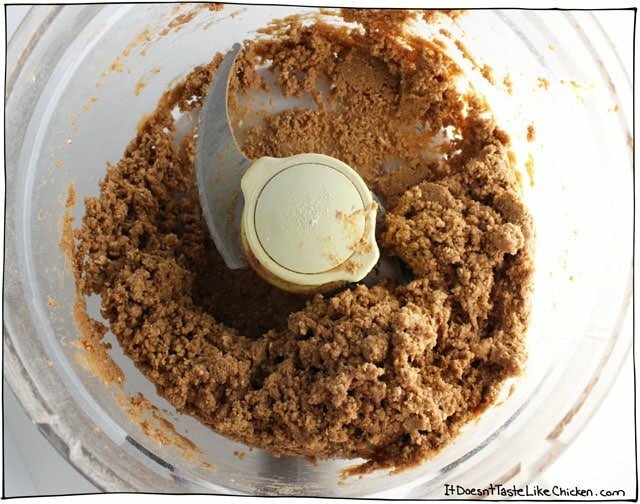 To make the bars: Add the oats to a food processor and blend well until the oats break down into a powder. Add the remaining ingredients for the bars, the PlantFusion protein powder, peanut butter, agave, vanilla extract, and salt. Blend well to combine, stopping to scrape the sides as needed. It will be a dry crumbly dough. Line an 8" x 8" pan with parchment paper, and leave some of the paper hanging over the edges to form handles. Scoop all the dough into the pan, and press firmly to spread the dough and pack it flat as possible into the pan. I find it's easiest to pack the bars down with my hands, and then smooth out with a spatula or other flat surface. To make the Chocolate Drizzle: Add the chocolate chips to a small pot and place over low heat. Stir continually as they melt, and remove from heat when almost completely melted but there are still a few remaining unmelted pieces. This is to ensure you do not burn the chocolate. Alternatively, you could melt the chocolate in a microwave, but I don't have one of those, so you will have to figure that out on your own. Use a spoon or fork to drizzle the chocolate across the bars in any pattern you like. Pop in the fridge or freezer for a few minutes for the chocolate to set. To make the Peanut Butter Drizzle: Melt the coconut oil, and whisk in the peanut butter and agave. If the mixture seems very thin, chill it in the fridge for freezer for a few minutes to thicken. If you chill it too long and it turns solid, just melt it again. 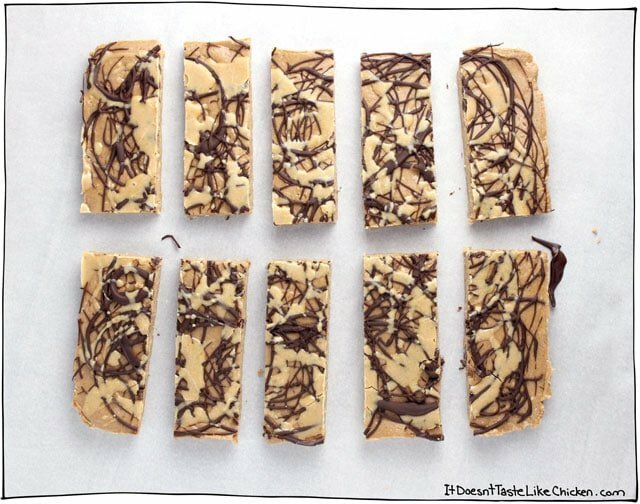 Use a spoon or fork to drizzle the mixture across the bars in any pattern you like. 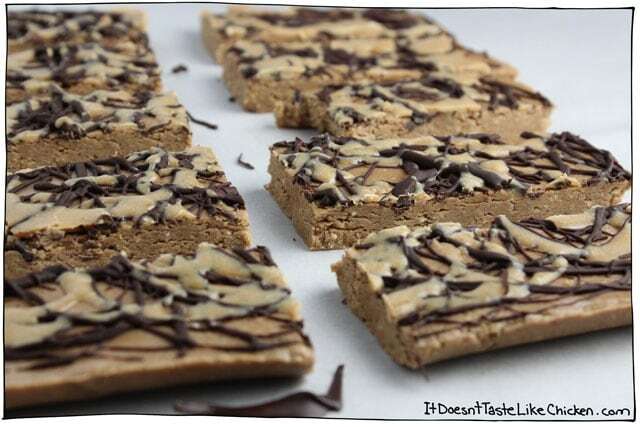 To set the bars: Put the pan of protein bars in the freezer for about 30 minutes until completely set. Once set, use the parchment to lift the bars out of the pan. Use a large knife to cut into bars or squares. Store in an air tight container in the freezer. These are best eaten straight from the freezer. Enjoy! Order a PlantFusion sample kit for just $10 here. Could I use pea protein powder for this recipe? I with you on the trainers obviously looking like they don’t practice what they preach! Congrats to your friend! Aww I’ll tell her you said so! I promise you, she definitely looks the part! Haha. This looks delicious! I should take advantage of my food processor more often and make these. I don’t use it nearly as often as I should. These would definitely be a great excuse! Haha, yes they would be! Food processors are magical! Omg I’m obsessed with these bars!!! I’m always looking for more high-protein vegan snacks. Thank goodness for awesome plant protein powders! Haha! Aww thanks! I’m obsessed with them too currently. So yummy! YUM! I will have to try the protein powder. I like Aloha for my smoothies but I am just not a smoothie kinda gal – love to EAT, you know? These are sustenance! I wish I would have been more serious about muscle at an earlier age … now it is very difficult to get rid of the flabbies but I am finding that the Bar Method gets me results! Haha! I do know! I go through smoothie phases every now and then, but then all of a sudden I will be totally over them and want only hearty foods. I haven’t tried bar method, will have to look into that. I’m pretty basic when it comes to my workouts, squats, lunges, deadlifts, presses… As long as you have good form and are using heavy enough weights, I find I get great results. Then I will throw in some cardio, even though it isn’t my favourite, but I know it’s good for my heart.